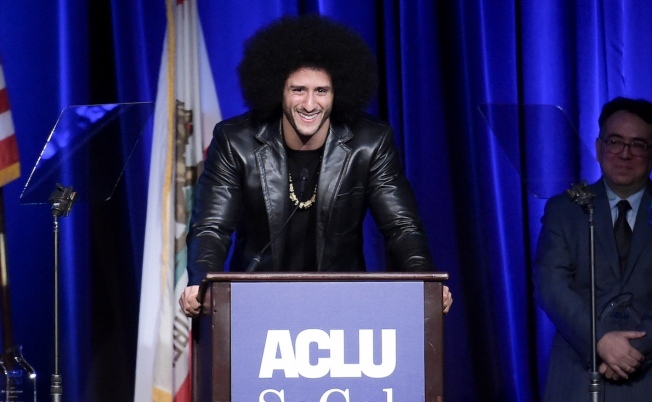 In this Dec. 3, 2017, file photo, Colin Kaepernick attends the 2017 ACLU SoCal's Bill of Rights Dinner at the Beverly Wilshire Hotel in Beverly Hills, Calif.
*An arbitrator is sending Colin Kaepernick's grievance with the NFL to trial, denying the league's request to throw out the quarterback's claims that owners conspired to keep him out of the league because of his protests of social injustice. Kaepernick's lawyer Mark Geragos tweeted a picture Thursday of a ruling by arbitrator Stephen B. Burbank. The former 49ers quarterback argues that owners have colluded to keep him off any NFL roster since he hit free agency in 2017. Kaepernick began a wave of protests by NFL players two seasons ago, kneeling during the national anthem to protest police brutality and racial inequality. The protests have grown into one of the most polarizing issues in sports, with President Donald Trump loudly urging the league to suspend or fire players who demonstrate during the anthem. Kaepernick contends the owners violated their collective bargaining agreement with players by conspiring to keep him off of teams. The case hinges on whether owners worked together rather than decided individually to not sign Kaepernick. A similar grievance is still pending by unsigned safety Eric Reid, who played with Kaepernick in San Francisco and joined in the protests. Meanwhile, the league and players union still haven't resolved whether players will be punished this season if they choose to kneel or demonstrate during the national anthem. Owners approved a policy requiring players to stand if they are on the sideline during the national anthem, allowing them to stay off the field if they wish. But the league and union put that on hold after the Miami Dolphins faced backlash for classifying the protests as conduct potentially detrimental to the team — putting players at risk of fines or suspensions.